I love the LFA a lot. So much, that I recently described it as the best car I’ve ever driven. Naturally, this caused both [Richard] Hammond & [James] May to scoff loudly. Mainly because — as they kept pointing out — it costs £359,590. That’s nearly five times more than a Nissan GT-R which, if anything, is even more technical. It’s way more, too, than a Ferrari 458 or a Merc SLS. It is, they argued, a stupid price. But they’re wrong. 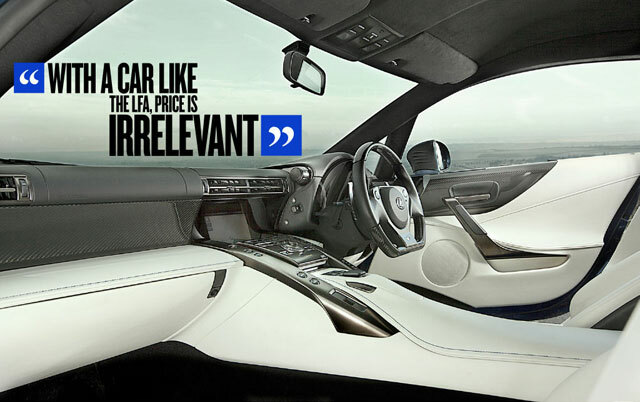 Arguing that the LFA is too expensive is like arguing that, at £100 billion, the Mona Lisa is too expensive. The Lexus LFA will also be appearing on tonight’s Top Gear episode, where it will go against an Aston Martin Vanquish and a SRT Viper — looking forward to it.